Hibernian manager Pat Fenlon lavished praise on striker Leigh Griffiths after his side knocked Kilmarnock out of the Scottish Cup. 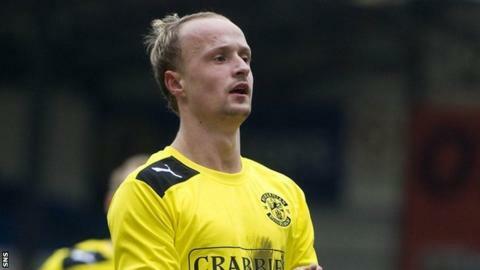 Fenlon's side overcame Kilmarnock 4-2 at Rugby Park, with the talismanic Griffiths grabbing a hat-trick. "His quality shines through all the time," said a delighted Fenlon. "He is a special talent. "We've worked hard for him, and he's working really hard for us - both on and off the park." The Irishman also singled out the contribution of combative midfielder Jorge Claros after what had proved a highly entertaining encounter. "I don't think Jorge Claros has got the credit he deserves in this country, but I thought he was tremendous," said the Hibs boss. "It was tight until late on, but I thought it was a real decent game of football, with two sets of players that went at it hammer and tongs. "I thought we deserved to win." Fenlon thought he would like another look at the penalty awarded by the assistant referee to Kilmarnock, which followed a challenge by Lewis Stevenson on Paul Heffernan and was converted by the latter to make it 2-2. "I'd like to see it again," said Fenlon. "I thought the referee was close enough to give it himself. "I was disappointed with the free-kick for their first goal, I didn't think it was a foul. "But I'm not going to come out and criticise referees, we all make mistakes and, if he got it right, then fair play to him." However, despite reaching the semi-final, Fenlon insisted that winning the competition would not atone for losing last year's final 5-1 to arch-rivals Hearts. "What happened last year was a disaster from our point of view and we'd like to put that right, but you can't change history," he added. "We've got to concentrate on the future and what's ahead of us. "We've got ourselves back into another semi-final which is great credit to all the players. "Who we get I'm not too bothered about. If we play like we did today we can beat anybody."